There is nothing quite like a beloved classic story. Think of a tale you remember from childhood that conjures up precious memories – one that has the power to transport you back in time to relive the joyful moments of youth. For some of us, those precious memories were created during the holidays. If you came from a family that enjoyed the theater, that memory may have come in the form of The Nutcracker – a magical ballet where a toy comes to life and saves a young girl from the dangers of her dreams. It is arguably the most well-known ballet ever created with an even more well-known musical score, and nearly every professional ballet dancer in the world has done one, if not dozens of performances of this holiday tradition. Here’s the thing with classics: as much as we may love them, we occasionally need something to refresh our palettes, which allows us to build the collection of things we love. This is exactly what American Ballet Theatre brings to Chicago’s Auditorium Theatre with Whipped Cream. The ballet tells the tale of a young boy whose achievement is awarded with a trip to a pastry shop, where his over-indulgence in sweets sends him into a whimsical and nightmarish delirium. The Nutcracker and Whipped Cream share many similarities, but the latter is certainly a more contemporary version that boasts sets and costume designs by pop surrealism painter Mark Ryden, choreography by Alexei Ratmansky and a rarely heard 1920’s score by Richard Strauss. With experience performing in both The Nutcracker and Whipped Cream, Rachel Richardson is the perfect person to ask about the differences and similarities between our beloved holiday classic and Ratmansky’s latest acclaimed ballet. DancerMusic Editor Kristi Licera recently had the chance to speak with ABT dancer Rachel Richardson, who joined the company in 2015. In addition to her position in the corps de ballet, Rachel has held the roles of Porcelain Princess in “Aurora’s Wedding”, Amour in Don Quixote, Moyna in Giselle, Columbine and one of the Nutcracker’s Sisters in The Nutcracker and the Fairy Miettes qui tombent (Breadcrumb) and the Gold Fairy in Alexei Ratmansky’s The Sleeping Beauty. Rachel has also performed several different roles in Whipped Cream and will grace the stage in Chicago as part of the corps de ballet. “Whipped Cream” is as much of a vehicle to showcase the dancing as it is to showcase the magnificence of the sets, props and costumes. Kristi Licera: Many comparisons have been made between Whipped Cream and The Nutcracker; each story follows a youthful main character through a series of dream-land adventures. Both main characters are rescued by an imaginary figure come to life – in The Nutcracker, the toy soldier; in Whipped Cream, Princess Praline. The dynamic of the plot line is similar, but that is where the similarities end. As with nearly all professional ballet dancers, you have done your fair share of Nutcracker productions, and soon you will be gracing the Auditorium Theatre stage in Whipped Cream as part of the corps de ballet. Can you share with us some of the major differences between the productions in terms of the set and costume design? What is the major difference between the stories in Whipped Cream and The Nutcracker? Rachel Richardson: I have danced in The Nutcracker for most of my life, but it took me by surprise the first time someone compared Whipped Cream to the holiday classic. At that point I hadn’t had a chance to see the show from the front since I dance several different parts. However, the more I thought about it, the more similarities I found. The modern designs of Mark Ryden work hand in hand with the contemporary choreographic approach to give the ballet several nontraditional surprises in both categories. There is certainly a different feel to dancing the two ballets. Specifically, I think of The Nutcracker as a classical ballet; Whipped Cream doesn’t have the same classical feel. After seeing the show from the audience, I was struck by its modern quality, which is a departure from the classical quality of most productions of The Nutcracker. Whipped Cream is as much of a vehicle to showcase the dancing as it is to showcase the magnificence of the sets, props and costumes. The modern designs of Mark Ryden work hand in hand with the contemporary choreographic approach to give the ballet several nontraditional surprises in both categories. While there are productions of The Nutcracker with updated versions of the traditional sets and costumes (ie. rat suits, Mother Ginger’s iconic skirt and stilts, doll boxes, etc. ), those used for Whipped Cream are even more fantastical, colorful and dark. To me, Whipped Cream is an extravagant spectacle that can be enjoyed year-round while The Nutcracker is a holiday classic. When we go on tour, we hire local [supernumeraries] to fill these roles, and they are always surprised by the intensity of their costumes in their first stage rehearsal. Rachel: While both productions use approximately 30 supernumerary characters, each uses them in a different way. In ABT’s Nutcracker, the supers are almost all children who dance in the opening scene; in Whipped Cream, the 30-plus supernumerary characters face the complexity of maneuvering in their intricate and challenging costumes. The supers are primarily fictional creatures used to give a deeper look into the kingdom of Princess Praline. These incredibly detailed costumes include a snow yak which requires two people to maneuver with two additional supers to assist, a smaller pink yak, cupcakes, a chocolate chip man and a long neck piggy. There are two supernumerary roles that portray humans, but each wears a very large fake head; one even wears platform shoes to make him over 7 feet tall. When we go on tour, we hire local supers to fill these roles, and they are always surprised by the intensity of their costumes in their first stage rehearsal. It usually takes the four people inside the snow yak several tries before they can successfully move it about the stage. There are unexpected costumes for company dancers as well. In particular, the corps men and women, portraying dancing cookies and whipped cream, respectively, have very unique costumes that would not appear in a more classical work. Rachel: There are unexpected costumes for company dancers as well. In particular, the corps men and women, portraying dancing cookies and whipped cream, respectively, have very unique costumes that would not appear in a more classical work. These include skirts and colorful cookie weapons for the men and translucent capes and pointed cream dollop hats for the women. These contrast the darker parts of Whipped Cream’s story, particularly in the Act 2 hospital scenes: evil nurses carry giant syringes and there is a blinking eye overlooking the scene. 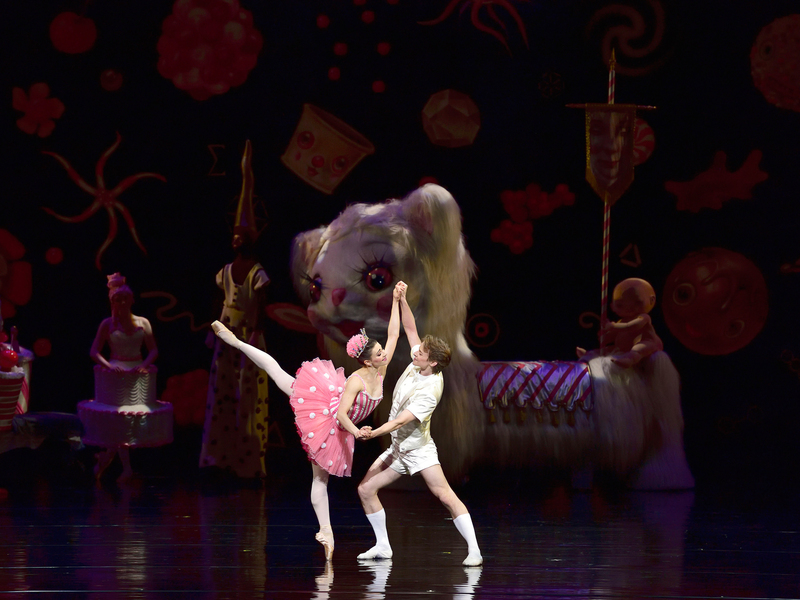 The color palette used in Whipped Cream also comes across as very modern – a contrast to the overall look of The Nutcracker. Whipped Cream uses dazzlingly bright hues and gold and silver sparkles while The Nutcracker sticks to more regal, classic tones. The sets and costumes created for ABT’s Nutcracker look appropriate to the 1800s, in which the story is meant to take place. Those used in Whipped Cream look modern even for today, despite the story being created in 1924. The sets for Whipped Cream are unbelievably intricate. We’ve done the production countless times, but I still find myself discovering new details in the many different sets used during the ballet. While Whipped Cream certainly ends with trumpets blaring and jazz hands shimmying, a deeper look shows a happy ending may not really be the message of the story. Rachel: Unlike The Nutcracker, Whipped Cream has underlying social commentary in the story-line which came out of the culture in Vienna after World War 1. This gives Whipped Cream a modern realism that differs from the pleasant, fairy tale quality of The Nutcracker. In Whipped Cream, this is seen in the bizarre severity of the boy’s illness, the doctor’s character and his interaction with the liquors (these were originally meant to represent France, Poland and Russia) and the hospital scenes. Even The Nutcracker‘s darkest moment, when Clara is frightened by life-size mice, is much lighter. Although the outline of the plots is similar, the overarching themes seem to be quite different. In both stories, the main character enters a dream world and is saved by someone within it. Clara is saved by her nutcracker doll and the boy in Whipped Cream is saved by Princess Praline. In The Nutcracker, Clara falls asleep and, in the end, returns to reality comforted by her real-life nutcracker toy. In Whipped Cream, the boy’s dream-world is triggered from being ill and later serves as an escape from reality. In the end, he stays in his dream world, with no good resolution to his situation in real-life. This almost mimics Strauss’ declaration “I cannot bear the tragedy of the present time. I want to create joy.” He was quoted saying this in response to a complaint that the ballet was too opulent at a time when reality was so destitute. It’s also worth noting The Nutcracker is holiday oriented, taking place during Christmas, which adds to its lighthearted message and uplifting ending. While Whipped Cream certainly ends with trumpets blaring and jazz hands shimmying, a deeper look shows a happy ending may not really be the message of the story. Since everyone has a slightly different way of moving and the goal is to be as together as possible, [Ratmansky] creates a conversation with the room in order to decipher which motion will be most organic for us and still give the aesthetic he has in mind. Kristi: Whipped Cream is set to the music of Richard Strauss. This rarely-heard score originally premiered at the Vienna State Opera in 1924, and it was up to choreographer Alexei Ratmansky create movement to embody and enhance it. Earlier we mentioned that you would be part of the corps de ballet in the upcoming performance of Whipped Cream. Typically, the corps is used to help create atmosphere and energy on stage. The focus is not really on the technical prowess of the corps dancers, but more focused on how the movement of a large body of dancers can add a visual or plot-driving component. Can you tell us more about what it was like working with Ratmansky as part of the corps de ballet in Whipped Cream? How does the score by Strauss support the choreography and the action of the story? Rachel: I love working with Ratmansky as a part of the corps de ballet because there is such a great sense of community in the rehearsals. He has a great balance of preparedness with his choreographic ideas and a flexibility to accommodate the dancers he’s working with. When creating a corps dance, that flexibility is useful when deciding how to get the group in and out of poses and the “traffic” issues from creating complicated formations. Since everyone has a slightly different way of moving and the goal is to be as together as possible, he creates a conversation with the room in order to decipher which motion will be most organic for us and still give the aesthetic he has in mind. He always comes to rehearsal with a fairly clear idea of what he wants and is very comfortable commanding a room full of dancers without ever seeming authoritarian. Ratmansky is rather notorious for creating lengthy and challenging corps dances and creates lots of opportunities for the corps to dance. The Whipped Cream Waltz at the end of Act 1 is a good example of this. In rehearsals, Ratmansky focused extensively on getting us to move more dramatically. The choreography includes a number of quick and tricky formation changes throughout. In order to achieve these while maintaining the expansive movement quality he wants is truly a stamina challenge. I’d guess every girl covers the entirety of the stage during the dance, and on stages like the Metropolitan Opera house, it involves quite a lot of running, bourréeing, waltzing and the like to get from point A to point B in the meager 2 counts you were given. There is a dark intensity to the music in parts of Act 2 that contrasts the cheery melodies heard in Act 1. This makes dancing as an evil nurse especially fun because the music helps you get into character. Rachel: In Whipped Cream, Ratmansky uses more contemporary movement to tell the story. The evil nurses in Act 2 have fun and dramatic choreography; their steps are more hunched and occasionally more turned in than classical ballet steps. The Dance of the Cookies in the first act incorporates unique choreographed fighting between the cookies using their different weapons. Even in the most classical section of the ballet, the pas d’action in Act 1, the women are on the floor multiple times which is extremely rare since they are in classical tutus. For the finale in Act 2, Ratmansky used several non-traditional choreographic ideas when the whole group is onstage, and that gives the ballet a modern, almost Broadway feel. The music for the entrances of both Prince Coffee and Princess Tea Flower so perfectly describe their characters; I clearly hear the self-assurance and pizazz of Prince Coffee and the playful delicacy of Princess Tea Flower. Rachel: I really enjoy the score to this ballet. There are lots of beautiful melodies and the rhythm and energy of the music lend themselves nicely to movement. There’s a clear difference between the energy of the music in the first act and the music used for the hospital scenes in Act 2. There is a dark intensity to the music in parts of Act 2 that contrasts the cheery melodies heard in Act 1. This makes dancing as an evil nurse especially fun because the music helps you get into character. To me, the music supports several character introductions quite well. The music for the entrances of both Prince Coffee and Princess Tea Flower so perfectly describe their characters; I clearly hear the self-assurance and pizazz of Prince Coffee and the playful delicacy of Princess Tea Flower. My father loves classical music and after seeing the production he purchased a record of the score. He surprised me last time I was home by choosing it as our house cleaning music, and despite having done the production too many times to count, I didn’t mind enough to spoil his fun, and ended up enjoying the next couple hours more than I was expecting. American Ballet Theatre presents the Chicago premiere of Whipped Cream at the Auditorium Theatre (50 E Ida B Wells Dr, Chicago, 60605) April 11, 12 and 13 at 7:30pm and April 13 and 14 at 2pm. Tickets and additional information are available online at tickets.auditoriumtheatre.org.